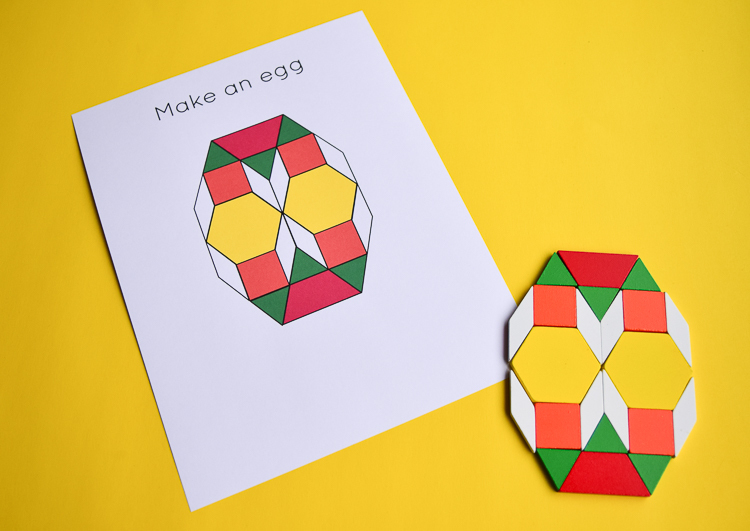 Get the free printable pack of Easter and spring pattern block designs for STEM centers in your preschool and kindergarten! Pattern blocks are far from being new in most classrooms, but they were a recent discovery for us. Even though we already have a lot of building materials, these little tiles filled a particular niche. 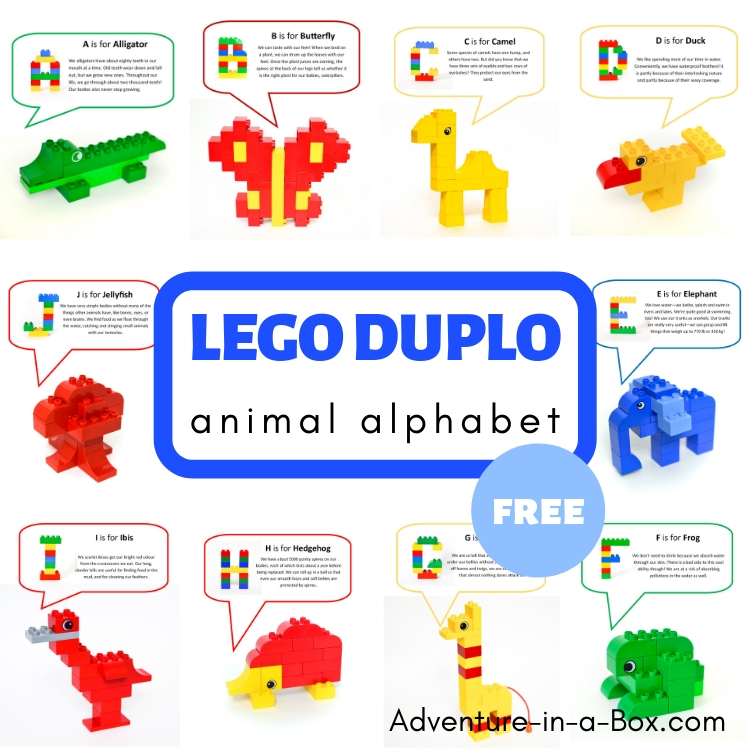 They are sturdy, portable, inexpensive, and they encourage children to build. Here are the classic pattern blocks, made from painted wood. Quite pleasant to touch! We also like magnetic pattern blocks – they’re good to work with because designs do not slip, and they’re also really easy to bring along wherever you go. 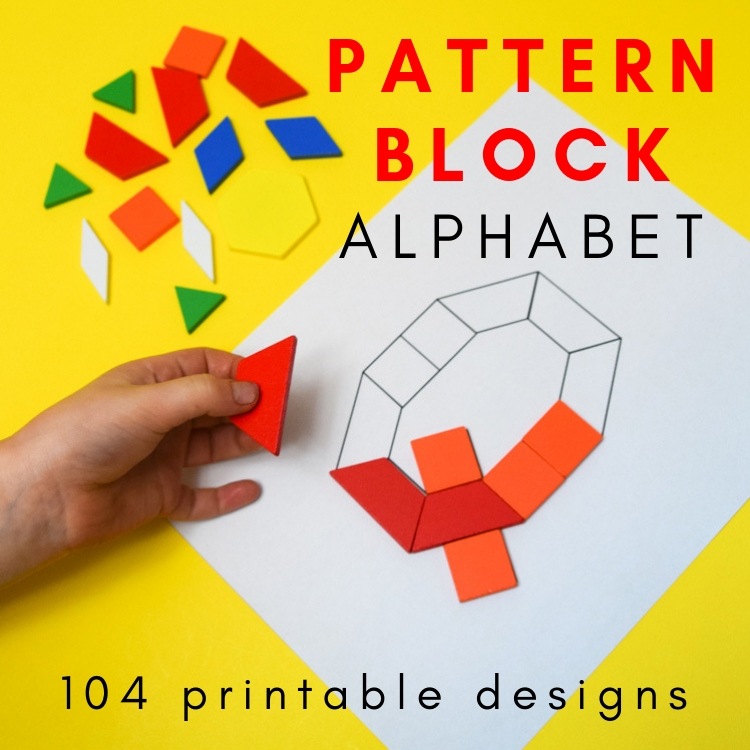 The pattern blocks usually come with a few design templates. Now, my kids like building their own creations, but they also find it very satisfying to work on those design cards. It’s like building puzzles to them. 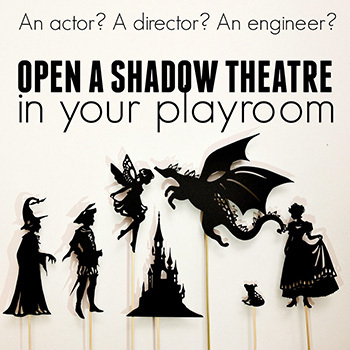 Following instruction is different mental activity than imaginative building, but it is an equally useful exercise! 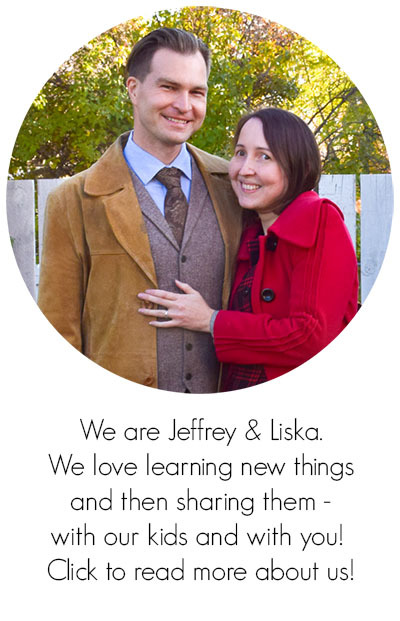 Why Use Pattern Block Design Templates? But, like I mentioned, only a few designs came with our blocks, and my children like new ones. So we created our own – the alphabet with 52 uppercase and lowercase designs for my older one and this spring-themed set for my younger one. She is almost three, and she is getting more and more interested in puzzles. 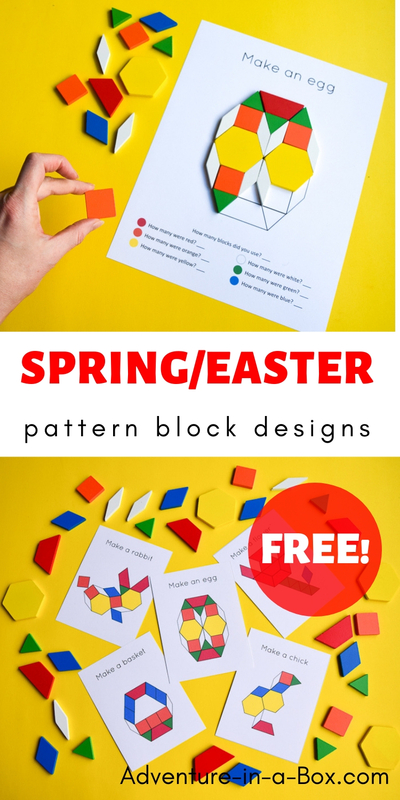 Together with design templates, these free pattern blocks can make a great seasonal center for preschoolers! 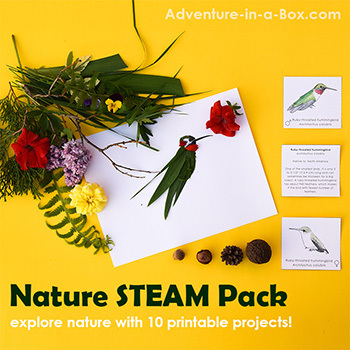 There are five designs in this free pack – an egg, a rabbit, a chick, a basket, and a tulip. What’s fun about them is that they come with different levels of complexity, based on the cards you choose to use. 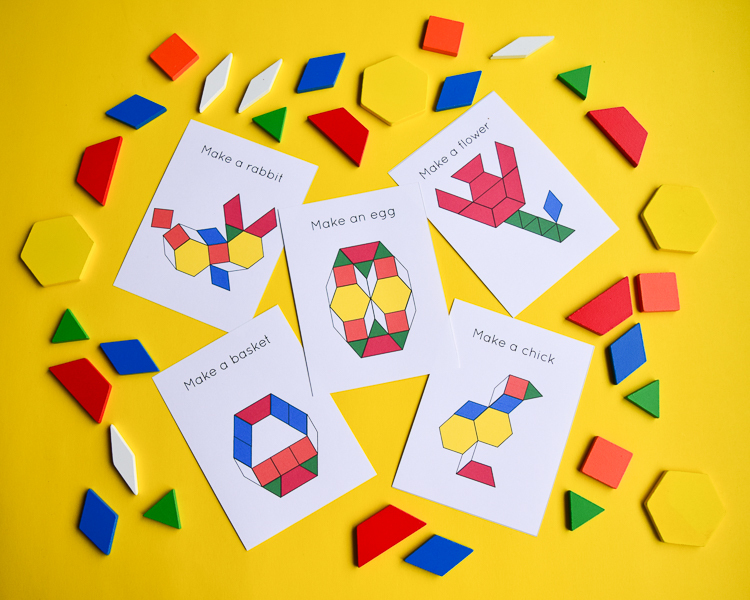 First of all, there are two scales of cards: four designs on one sheet (convenient card size) and one design per sheet (100% scale and easiest to replicate for young children). 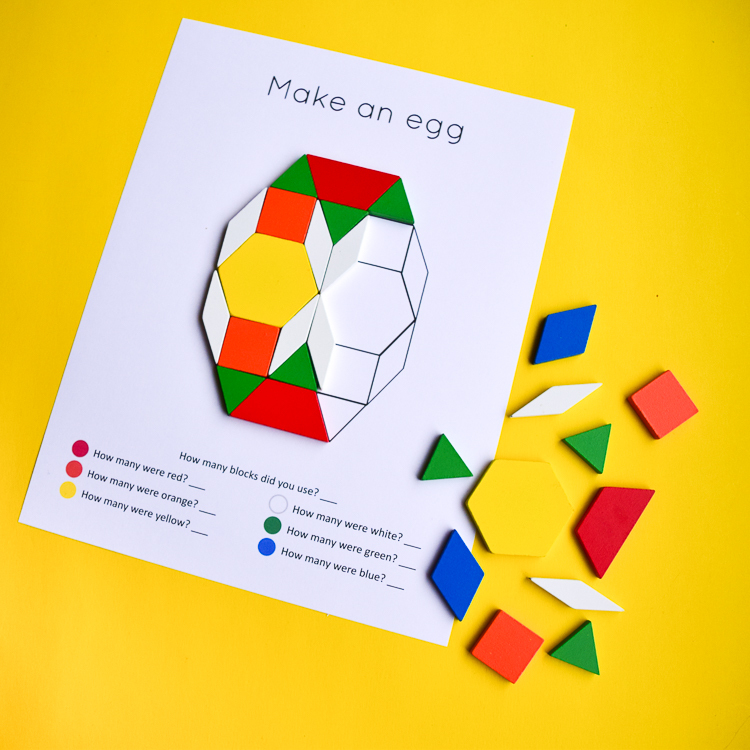 Second, there are coloured and black-and-white templates: the former are easier to use, while the latter encourage children to pay attention to the shape rather than the colour. 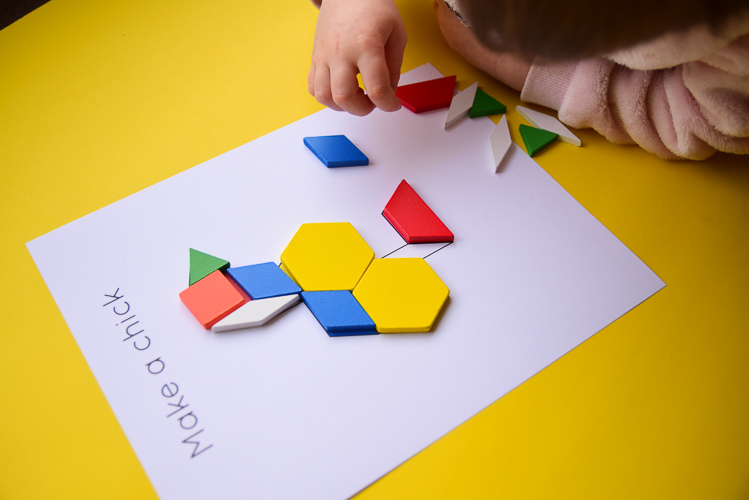 You can also notice above that there are cards that ask children to solve an additional mathematical problem by counting the blocks of a certain colour and the number of all blocks used. 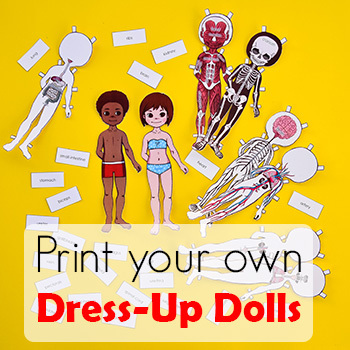 Download them for free below, print and cut the cards. 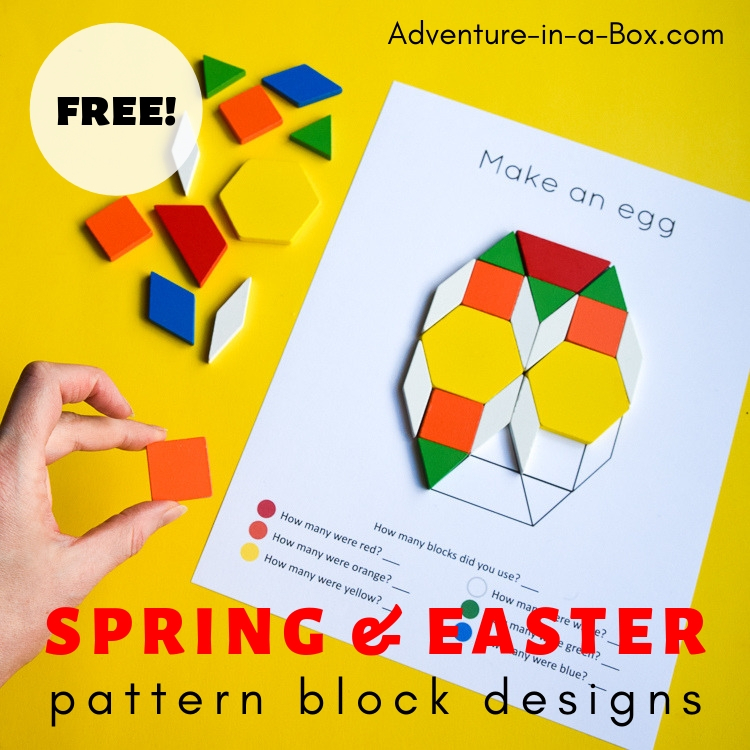 Use them as inspiration for building designs with pattern blocks, or set up an Easter/spring-themed STEM center!